Factor V Leiden is a blood clotting disorder. It is not a disease. Factor V is a protein that is needed for blood to clot properly. Some people do not have the normal Factor V protein. Instead, they have an different form called Factor V Leiden. This is caused by a change (mutation) in the gene for this protein. The different gene that makes the Factor V Leiden protein is inherited from one or both parents. The Factor V Leiden protein is harder to “turn off” than the normal Factor V protein. This makes blood clots more likely to form, a condition called thrombophilia. 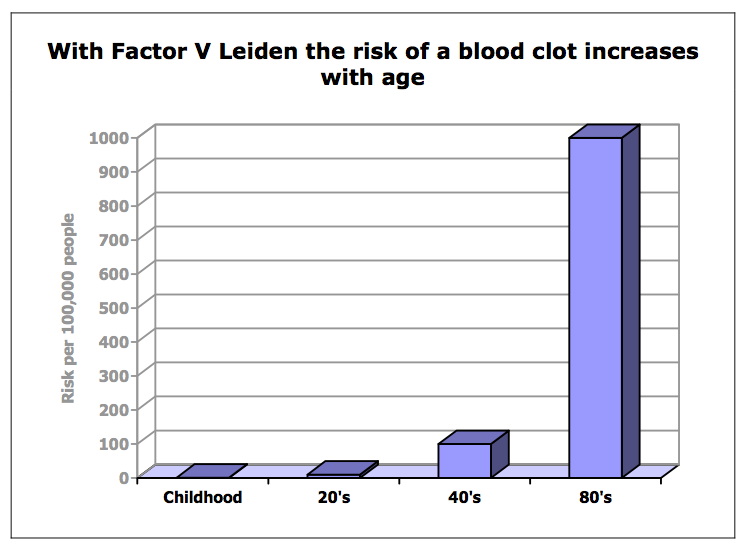 If you have Factor V Leiden, you have a greater chance of developing blood clots. 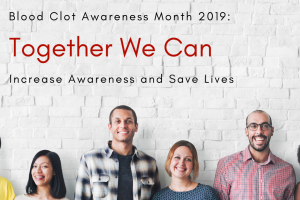 Blood clots in the deep veins in your legs (called deep vein thrombosis or DVT) or in your lungs (called pulmonary embolus or PE) can be dangerous. How does Factor V Leiden affect clotting? When you are injured, your body stops bleeding by changing liquid blood into a plug (clot) that blocks the leaks in damaged blood vessels. Factor V is one of the proteins needed to make blood form clots. The clotting action of Factor V is controlled by another protein called Activated Protein C. To stop blood from forming clots, Activated Protein C easily turns off Factor V.
Activated Protein C does not work as well on the abnormal Factor V Leiden protein. Factor V Leiden resists the effects of Activated Protein C, so it takes longer to turn off Factor V Leiden. As a result, clotting goes on longer than usual. This is why Factor V Leiden is sometimes called Activated Protein C Resistance and why people with this mutation clot more than those without it. A blood test (called a screening test) can show if you have Activated Protein C resistance. If you do, another blood test that examines your genes (called DNA) will be done to find out if Factor V Leiden is the cause of the resistance and what type of Factor V Leiden you have. Some hospitals do only the DNA test and not the screening test. How did I get Factor V Leiden? There are 2 copies for Factor V gene, which are passed down from our parents. We inherit one gene from our mother and one from our father. At least 1 of the genes that you inherited is the mutated gene that makes the Factor V Leiden protein. If you inherited 1 Factor V Leiden gene from one parent, you have the heterozygous type of Factor V Leiden. You have 1 Factor V Leiden gene from one parent and 1 normal Factor V gene from your other parent. In your body, you have 50% Factor V Leiden and 50% normal Factor V.
This happens in about 5 out of 100 people of Caucasian decent. 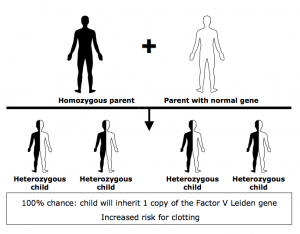 If you inherited 2 Factor V Leiden genes, you have the homozygous type of Factor V Leiden. •You inherited one Factor V Leiden gene from your mother and one from your father. In your body, you have 100% of Factor V Leiden and no normal Factor V.
This happens in less than 1 out of 100 people. 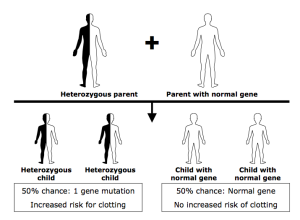 Factor V Leiden is an inherited disorder. Your brothers and sisters may have inherited the mutated gene for Factor V Leiden, just like you did. 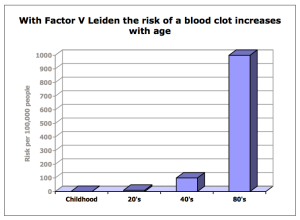 Having Factor V Leiden means that you have a greater chance of developing a dangerous blood clot in your legs (DVT) or lungs (PE). 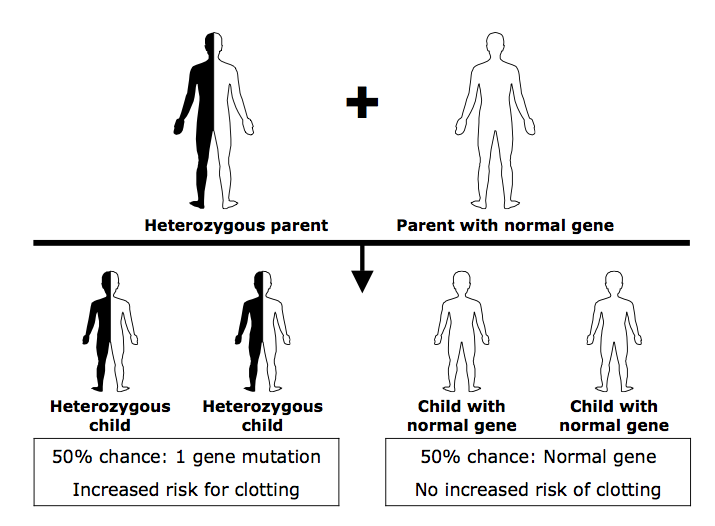 Having 1 Factor V Leiden gene (heterozygous type) slightly increases the chance of developing a blood clot. Having 2 Factor V Leiden genes (homozygous type) makes the risk much greater. Having Factor V Leiden does not appear to increase the chances of developing a heart attack or stroke. It is not associated with an increase risk of cancer or birth defects. Some research suggests that women with the Factor V Leiden gene who have had pregnancy losses may have a greater risk of miscarriages. Can Factor V Leiden be treated? There is no treatment that can prevent this disorder or make it go away. However, there are things that you can do to reduce your chances of developing a dangerous blood clot. You do need treatment with “blood thinners” if you have had a blood clot or develop one in the future. These medications (called anti-coagulants) help to prevent clotting. If you have never had a blood clot, you do not need treatment with blood thinners. In situations where there is a greater chance of clotting (such as surgery, a leg cast, a serious illness or pregnancy) you may be treated with blood thinners until the risk has passed. What can I do to avoid blood clots? Eat well. Enjoy a variety of foods from the 4 food groups. If you are overweight or obese, consider the benefits of losing weight. When you are ready, talk with your health care provider for advice and help to lose weight. Build physical activity into your daily life. Be active in ways you enjoy. Exercise regularly, such as walking, swimming or riding a bike 3 times a week. If you have an inactive (sedentary) lifestyle, consider how you could gradually increase your physical activity at home, school, work or play. Talk with your health care provider about how to do this safely. Take care when traveling long distances. During long car rides, stop every few hours and take a short walk. This helps keep the blood flowing in your legs. 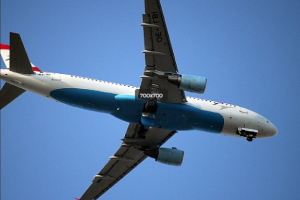 On a long flight, take regular walks down the aisles of the plane. Drink plenty of fluids (without alcohol). Your doctor can tell you how much fluid is right for your age, health and activity level. If you smoke, consider the benefits of quitting. When you are ready, talk with your health care provider for advice and help to stop smoking. There are many programs, websites and tools that can help you quit. What about risks I can’t avoid? Serious illness, casts and surgery can increase your chances of developing blood clots. When you need health care or go to the hospital, tell your healthcare team that you have Factor V Leiden, so that they can plan the care you need. You may be treated with blood thinners until the risk has passed. If you have other chronic conditions such as diabetes, work with your health team to manage your health. Women have a greater chance of developing a blood clot during pregnancy. Before becoming pregnant, talk with your doctor about how your risk of blood clots can be managed during pregnancy, childbirth and for 6 weeks postpartum. You may be treated with blood thinners during this time. Hormones and birth control pills also increase women’s risk of blood clots. Talk with your doctor about the risks and benefits of taking these medications. How will I know if I get blood clot? Learn to recognize the signs of a blood clot so that you can get help as soon as possible. If you notice any of these problems, call your doctor right away. If you cannot reach your doctor, go to the nearest hospital emergency room. Can I pass on Factor V Leiden? Yes, you can pass on the gene for this disorder to your children. 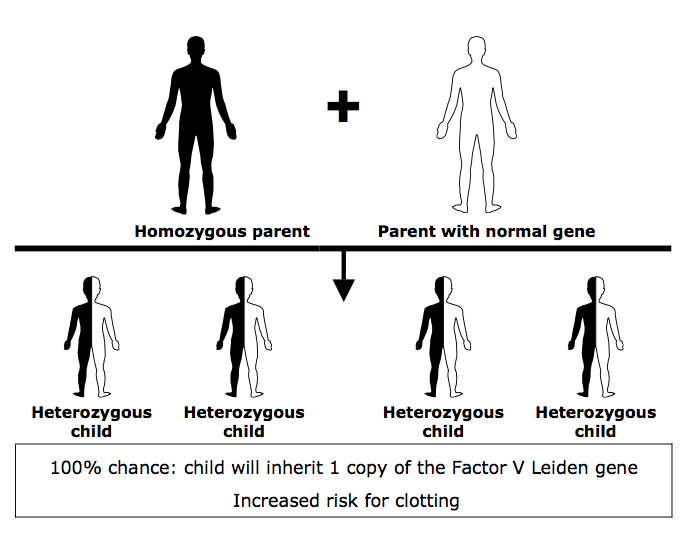 If you have the heterozygous type, there is a 50% chance that your child will inherit a Factor V Leiden gene from you. There is also a 50% chance that your child will inherit your normal Factor V gene. If you have the homozygous type, your child will inherit a Factor V Leiden gene. Your child will have either the heterozygous or homozygous type, depending on whether the gene passed down from his or her other parent is normal (Factor V) or abnormal (Factor V Leiden).